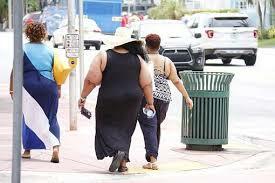 BREAKING NEWS SPECIAL: HEALTH NEWS CENTER: American adults are getting fatter! HEALTH NEWS CENTER: American adults are getting fatter! It seems that American adults continue to pile up more weight as they continue to follow unhealthy eating habits. According to a new data, nearly 40 percent of American adults were obese in 2015 and 2016, a sharp increase from a decade earlier, federal health officials said. "The prevalence of severe obesity in American adults is also rising, heightening their risks of developing heart disease, diabetes and various cancers," the officials added. According to the latest data, published in JAMA, at least 7.7 percent of American adults were severely obese in the same period. The data gathered in a large-scale federal survey, National Health and Nutrition Examination Survey, measured trends in obesity from 2015 and 2016 back to 2007 and 2008 when 5.7 percent of American adults were severely obese and 33.7 percent were obese. The survey counted people with a body mass index of 30 or more as obese, and those with a Body Mass Index (BMI) of 40 or more as severely obese, The New York Times reported. Most US public health experts expressed concerns by the continuing rise in obesity among adults and by the fact that efforts to educate people about the health risks of an unhealthy diet might have probably failed. “Most people know that being overweight or obese is unhealthy and if you eat too much that contributes to beingoverweight. But just telling people there’s a problem doesn’t solve it,” said Dr. James Krieger, clinical professor of medicine at the University of Washington and executive director of Healthy Food America, an advocacy group. The latest data from the survey comes at a time when the American food industry is calling for stronger measures to combat obesity. In the recent NAFTA (North Atlantic Free Trade Organisation) negotiations, the Trump administration proposed rules favoured by major food companies that would limit the ability of the US, Mexico and Canada to require prominent labels on packaged foods warning about the health risks of foods high in sugar and fat. "While the latest survey data does not explain why Americans continue to get heavier, nutritionists and other experts cite lifestyle, genetics, and, most importantly, a poor diet as factors. Fast food sales in the United States has risen to 22.7 percent from 2012 to 2017, while packaged food sales rose 8.8 percent," according to Euromonitor. The latest survey data found that American youth are faring somewhat better than their adult counterparts. In the age group between 2 to 19, 18.5 percent were obese in the 2015 and 2016, while 5.6 percent were severely obese. The study also found that the percentage of youths who are obese and severely obese rose slightly from the period between 2007-2008, but not enough to be statistically significant.